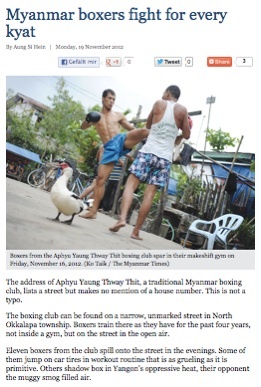 Aphyu Yaung Thway Thit Gym is a traditional Myanmar boxing club that can be found on a narrow, unmarked street in North Okkalapa Township in Yangon. Boxers train there not in an inside a gym, but on the street in the open air. The image series and video were captured by AndréRené of www.SouthEastAsianBoxing.com / www. Action-Foto.de during his one-week stay in Yangon in March 2011. For more information about the Gym, please follow the link to the newspaper article of the Myanmar Times online edition.